This past week, I visited with Chris Willis, one of the vice presidents at work about the content users are creating on Footnote. They are writing about all types of historical information ranging from love letters written in World War II, to the hanging of witches in Salem. I am particularly interested in the latter topic because one of the 'witches' was my direct ancestor and two others are 9th great aunts. Why do people write about their ancestors and historical events? It is because we are fascinated with the events in their lives both within their families and in the society and world where and when they lived. 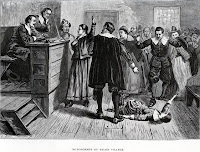 Twelve years ago, my wife and I spent several days in Salem, Massachusetts reading original documents about my great grandmother, Susanna North Martin's -- trial for being a 'witch'. We toured the city and surrounding area locating the homes and headstones of our ancestors. We continued north to Stewartstown, New Hampshire where another of my ancestral families lived for over 100 years and fell in love with the location and the scenery. While in Stewartstown, we found the old family cemetery and took photos of all of the headstones and copied the inscriptions on them knowing that most of them wouldn't be readable in the photos. A favorite memory was driving the 100 feet across the Connecticut 'River' into Vermont for a dinner that was every bit as good as those that 'Mom' cooked. Of course it was good; the chef was a 'young' lady with a dozen grandchildren and everyone in the place called her 'Mom'. We drove south the next morning to Plymouth, Massachusetts, where my ancestral families had lived for almost 300 years, since 18 of my grandparents stepped off the Mayflower. We found headstones for so many of my ancestors on Burial Hill in Plymouth, that it felt like a family reunion. Connie took a photo of me standing on the front steps of the Drew home at 51 Pleasant Street which was built by my 3rd great grandfather and housed the family for four generations thereafter. When we got home I looked through some photos that I'd found in the Calaveras County Historical Society in California that showed my great grandaunt standing just a few feet away from the location where I had stood on the steps of the house. The only differences were minor cosmetics on the fascia of the home, over 100 years time and the ugly hat she wore. Well, maybe her black dress was a little different too. We found the hill in Salem that was used when they hung grandma Susanna. We drank water from the spring Seth and Azuba Tirrill used for their water supply in Stewartstown. We walked to the homes, business locations and graves of hundreds of my ancestors in and around Plymouth. We stood on the hill where many of my Mayflower ancestors were buried during that first winter and looked out over Plymouth harbor. We felt our ancestors with us at every stop .... at every ancestral home .... in every cemetery .... in every village green that we visited. Again, do I write about them? Yes, I do. I now 'know' them much more than ever before. I love them. Do you write about your ancestors? Sure you do. If not on paper then in your minds and hearts. Take the time to go and visit old family homesteads, towns, and burial grounds soon. Keep your minds, eyes and ears open and let the spirits of your ancestors take you on a tour of where they lived in the world. You'll always be happy you made the trip. For now, start writing about growing up at your parents house. Write about grandma, grandpa and all your crazy aunts and uncles. Find the stories, events, photos and documents associated with their lives. They will become 'real' people to your children and grandchildren as seen through your eyes and in the records of their lives. Maybe you'll be 'real' to your great grandchildren one day too .... because someone wrote about you and your life, walked where you walked and smelled the apple blossoms there in the spring.